In its third year, the ‘Bloody Good Dinner’ has secured a reputation amongst the international culinary circuit as a highlight on the Melbourne gastronomy calendar. This year, David Pynt, head chef and owner of the highly accoladed Burnt Ends in Singapore will headline the event with his modern Australian barbecue menu. 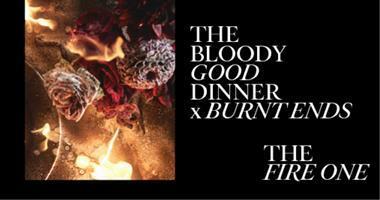 The ‘Bloody Good Dinner’ is a collaborative partnership between the Snowdome Foundation and Maddie Riewoldt’s Vision. Due to demand, the event has grown year on year and in 2019 will attract 600 guests who will raise money for urgent medical research to accelerate access to next generation treatments for blood cancers and Bone Marrow Failure Syndromes. In 2018, Burnt Ends received the high honour of a Michelin Star and has established itself as an integral part of Singapore’s new food order and the country’s historic Chinatown neighbourhood. Currently Burnt Ends sits at number 10 in the Asia 50 Best and places at 61 in the coveted World’s 50 Best Restaurants. The modern Australian barbecue restaurant is famous for its open-concept kitchen with custom-made grills attracting guests from around the globe. Chef Pynt’s bespoke menu will provide a visual for guests with open grills fired by a tonne of red gum to deliver dishes such as King Crab, Garlic Brown Butter with Sourdough and O’Connor’s Strip Loin, Marron Hollandaise, Bone Marrow Buns and Butterhead. A Pear and Hazelnut Tarte Tatin will be served for dessert and before the evening concludes, the flames will roast handmade marshmallows for guests. The increased interest and capacity of this years ‘Bloody Good Dinner’ event aims to exceed the $740,000 raised last year. The monies raised on the night will be directed toward two things: a world-first cutting-edge blood cancer research program as Snowdome works to ‘make hope real’ for Australian blood cancer patients and Maddie's Vision will continue to fund the Centre of Research Excellence with a focus on access to genomic testing. The funds raised at last year’s ‘Bloody Good Dinner’ supported Dr. Belinda Guo from the University of Western Australia to be awarded the Gunn Family National Career Development Fellowship for Women in Haematology. Additionally, the monies raised supported The Centre of Research Excellence in Bone Marrow Biology and thirdly, kick started the Australian arm of an international trial to measure the benefits of different treatment options in newly diagnosed patients with advanced Follicular Lymphoma. A raffle and auction will be held on the night offering items and money can’t buy experiences donated by sponsors including, but not limited to, Mercedes Benz, Imperium Collection’s Eichardt’s Private Hotel, Boss, Blake’s Feast, Collective Furniture, Crown, The Australian Ballet, Sand Hill Road Group, Longines, The AFL, and Kerry Armstrong. The ‘Bloody Good Dinner’ 2019 is being held in Melbourne on Wednesday 5 June at the Timber Yard and hosted by Hamish McLachlan.